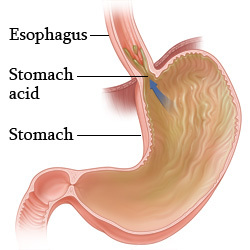 Gastroesophageal reflux disease (GERD) is excessive reflux of hydrochloric acid into the esophagus. Incompetent lower esophageal sphincter (LES), pyloric stenosis or a motility disorder. A weak or incompetent LES allows backward movement of gastric contents into the esophagus; decreased esophageal peristalsis and salivary function impair clearance of the refluxed acid, resulting in mucosal injury to the esophagus. Teach the client to avoid factors that increase lower esophageal irritation. Avoid irritants, such as spicy or acidic foods, alcohol, caffeine, and tobacco, because they increase gastric acid production. Administer medications, which may include antacids, histamine-receptor antagonists, and proton-pump inhibitors. The state in which an individual who is not on NPO, experiences or is at risk for inadequate intake or metabolism of nutrients for metabolic needs with or without weight loss. Patient will ingest daily nutritional requirements in accordance to his activity level and metabolic needs. Accurately measure the patient’s weight and height. Rationale: Determining the feeding habits of the client can provide a basis for establishing a nutritional plan. Encourage small frequent meals of high calories and high protein foods. Rationale: Small and frequent meals are easier to digest. Instruct to remain in upright position at least 2 hours after meals; avoiding eating 3 hours before bedtime. Rationale: Helps control reflux and causes less irritation from reflux action into esophagus. Instruct patient to eat slowly and masticate foods well. Rationale: Used to identify the type and extent of tissue damage. Rationale: Used to document pathologic acid reflux, especially for patients who have atypical symptoms. The state in which an individual experiences and reports the presence of severe discomfort or an uncomfortable sensation lasting from 1 seconds to <6 months. Client will report pain is relieved. Rationale: Heartburn is the most common feature of GERD. This becomes more severe with vigorous exercise, bending, or lying down. Carefully assess pain location and discern pain from GERD and angina pectoris. Rationale: Pain of esophageal spasm resulting from reflux esophagitis tends to be chronic and may mimic angina pectoris: radiating to the neck, jaws, and arms. Please check out the nursing interventions in the other nursing diagnoses. The state in which an individual experiences or is at risk of experiencing weight gain related to an intake in excess of metabolic requirements. Client will achieve and maintain an adequate body weight. Client will carry out exercise program and weight reduction plan as devised. Assess patient for dietary history intake, eating patterns, the importance of eating, and potentials for where dietary exercises can be limited. Rationale: Provides information regarding factors associated with being overweight or obesity problems and assists in establishing a plan of care for weight reduction. Note: Elderly tend to gain weight faster and easily because of decreased activity and a lower metabolic rate. Identify amount of weight loss needed for optimal body size and frame. Rationale: Provides basis for dietary planning. Weight patient every day, on same scale, same time if possible, same amount of clothing. Rationale: Provides goal achievement weight loss information, or lack of progress that may require changes or deviation in the plan of care. Weighing on same scale helps consistency of data. Establish a dietary plan for weekly goals of weight loss of one pound. Encourage patient to make gradual changes in dietary habits. Rationale: Prevents frustration from lack of achieving goals. A reduction of approximately 500 calories per day will achieve the prescribed goal. Provide activities for the patient that do not center around or are associated with meals or snacks. Rationale: Utilize calories and provides diversion from eating; being overweight increases abdominal pressure, which can then push stomach contents up into the esophagus. Commend patient for his success and efforts in losing weight. Rationale: Weight reduction may alleviate some of patient’s physical symptoms, and praise encourages continued progress. Assist patient and develop a modified exercise program, such as walking, or low-impact exercises. Rationale: Increases utilization of calories, increases endurance, and maintains musculoskeletal strength. Regularly scheduled exercise facilitates improvement of self-worth and self-esteem. Instruct patient and/or family regarding dietary restrictions, modifying favorite foods to use lower calorie substitute ingredients, and to make choices that provide for adequate nutritional intake. Rationale: Promotes weight reduction plan by allowing the patient to use familiar foods that have had calories cut down. Instruct patient to keep a dietary log of intake for calorie counting. Rationale: Facilitates adeuqate nutritional intake and calorie reduction. Most patients are unaware of the “hidden” calories in food they ingest. Instruct patient regarding community resources, weight reduction programs, or support groups. Rationale: Dietary requirements usually decrease with age by approximately 10-25%. Overeating, together with reduction in metabolic rate, continues obesity. Consult with dietician for meal planning and food preparation. Rationale: Provides meal planning and appropriate nutritional guidance. The state in which a person is at risk for entry of secretions, solids, or fluids into the tracheobronchial passages. Depressed gag and cough reflex. Assess for pulmonary symptoms resulting from reflux of gastric content. Rationale: These include subsequent aspiration, chronic pulmonary disease, or nocturnal wheezing, bronchitis, asthma, morning hoarseness, and cough. Rationale: This is a rare condition wherein the patient awakens with coughing, choking, and and a mouthful of saliva. Assess patient’s ability to swallow and the presence of gag reflex. Have the patient swallow a sip of water. Rationale: Loss of the gag reflex increases the risk of aspiration. Avoid placing patient in supine position, have the patient sit upright after meals. Rationale: Supine position after meals can increase regurgitation of acid. Instruct patient to avoid highly seasoned food, acidic juices, alcoholic drinks, bedtime snacks, and foods high in fat. Rationale: These can reduce the lower esophageal sphincter pressure. Elevate HOB while in bed. Rationale: To prevent aspiration by preventing the gastric acid to flow back in the esophagus. Avoid nasogastric intubation for more than five (5) days. Rationale: The tube interferes with sphincter integrity and allows reflux, especially when the patient lies flat. Instruct the patient to chew food thoroughly and eat slowly. Rationale: Well-masticated food is easier to swallow. Food should be cut into small pieces. If the patient has dysphagia, put the patient on NPO and notify physician. Rationale: Patient at high risk for aspiration should be kept NPO until swallowing study has been completed. The state in which an individual or group experiences a deficiency in cognitive knowledge or psychomotor skills concerning the condition or treatment plan. lack of information regarding condition/disease process. Client will have increased knowledge of actions that reduce reflux. Assess patient for information needed and ability to perform actions independently. Rationale: Provides a basis for teaching. Assist with the reduction in caloric intake. Rationale: Overweight increases intraabdominal pressure. Provide patient with information regarding disease process, health practices that can be changed, and medications to be utilized. Rationale: Provides knowledge and facilitates compliance. Instruct patient regarding eating small amounts of bland food followed by a small amount of water. Instruct to remain in upright position at least 1–2 hours after meals, and to avoid eating within 2–4 hours of bedtime. Rationale: Gravity helps control reflux and causes less irritation from reflux action into the esophagus. Instruct patient to avoid bending over, coughing, straining at defecations, and other activities that increase reflux. Rationale: Promotes comfort by the decrease in intra-abdominal pressure, which reduces the reflux of gastric contents. Instruct patients to eat slowly, chew foods well and maintain a high-protein, low-fat diet. Instruct patient to avoid temperature extremes of food, spicy foods, and citrus, and gas forming foods. Rationale: These food items increase acid production that precipitates heartburn and increased reflux. Instruct patient regarding avoidance of alcohol, smoking, and caffeinated beverages. Rationale: Increases acid production and may cause esophageal spasms. Instruct patient to raise both arms, fully extended towards the ceiling prior to eating. Rationale: Relieves spasms and allows for more comfort when eating. Instruct patient in medications, effects, side effects, and to report to physician if symptoms persist despite medication treatment. Rationale: Promotes knowledge, facilitates compliance with treatment, and allows for prompt identification of potential need for changes in medication regimen to prevent complications. Antacids and H2 receptor antagonistslike famotidine (Pepcid), nizatidine (Axid), or ranitidine (Zantac). Rationale: Acts by neutralizing the acid in the stomach, therefore, helps relieve pain. Proton pump inhibitors such as lansoprazole (Prevacid), rabeprazole (AcipHex), esomeprazole (Nexium), omeprazole (Prilosec), and pantoprazole (Protonix). Rationale: Works by decreasing the release of gastric acid. Prokinetic agents such as bethanechol (Urecholine), domperidone (Motilium), and metoclopramide (Reglan). Rationale: Helps hasten the gastric emptying time. Metoclopramide has extrapyramidal side effects that are increased in certain neuromuscular disorders (e.g., Parkinson’s disease); it should only be used if no other option exists. Rationale: Helps ulcer healing by forming a protective barrier on the surface of the ulcer. Rationale: Used to replace gastric prostaglandins that have been depleted by the use of NSAIDs; decreases basal gastric acid secretion and increases gastric mucus and bicarbonate production. Instruct the patient for correct preparation for diagnostic testing. Rationale: No food intake for 6 to 8 hours prior to barium swallow or endoscopy. Instruct the patient to avoid smoking. Rationale: Nicotine relaxes the esophageal sphincter and stimulates the production of stomach acid. It can also injure the esophagus causing irritation making it more susceptible to damage from acid reflux. Lastly, smoking can decrease gastric motility and reduces the effectiveness of digestion because the stomach takes longer to empty. Rationale: Alcohol can increase the production of stomach acid and can also lower the esophageal sphincter, which allows stomach acids to move up into the esophagus. Alcohol also makes the esophagus more sensitive to stomach acid.